A Google search for the term 'business' provides about 115,000,000 hits - a more restrictive and relevant search for 'business clipart' yielded 230,000 hits. Actually 'business clipart' as a term is a misnomer - it usually comprises collections of designs depicting offices and people - but types of business are almost as varied as humanity itself, thus the scope of such clipart collections should not be so finite. Looking at another angle - business clipart can also be classified as clip media which is optimized for business use. It is often stored and catalogued efficiently, so that quick searches can yield required visual content - that's exactly what Hemera's GraphicsDesk services sets out to achieve. Hemera Technologies, headquartered in Gatineau, Quebec, Canada is a top tier vendor of high quality clip media. Founded in 1997, Hemera's path-breaking collection of Photo-Objects has won accolades the world over as a whole new medium for realistic photo quality graphics - as opposed to conventional vector clipart. Hemera's product range also includes the award winning "The Big Box of Art" collection. More than an online clipart collection, GraphicsDesk is a subscription service that assists you find visual content in an easy, convenient and accessible fashion. Most of the content is geared to the business or semi-professional user as opposed to professional design houses. If you have your own portfolio and/or digital asset management systems in place, GraphicsDesk may not attract you - although you can still derive benefit from a subscription. If you fumble between clipart collections - swapping CDs all the time to find that elusive design - or if you travel often and need an online service which caters to your needs anywhere - then you might not find a better solution than GraphicsDesk. GraphicsDesk brings Hemera's patent-pending search mechanisms to anyone with online access - it's undeniably the best way to find designs. The current application weighs at 13.5 mb for a Windows version - a Macintosh version should be available before the end of 2002. I installed the downloaded application locally - then launched it. The signup process is included within the GraphicsDesk interface using the "Online -> Register as a New User..." option. A step-by-step wizard leads you through the signup process - basically this translates to choosing a subscription period ranging from a week to a year. We'll discuss pricing later in this review. Each subscriber is alloted a unique login:password combination. I wasn't online when I launched GraphicsDesk for the first time - so I was pleasantly surprised to find all my Hemera offline clipart collections catalogued within the interface. This actually means that GraphicsDesk can act as a unified interface for all your clipart - online or offline. As more clipart vendors choose to incorporate their content within the GraphicsDesk umbrella, you might find new third-party offerings using both offline and subscription models. I decided it was time to get connected online and login - you login through the log-in option within the Online menu. You are prompted to enter your login and password details - you can opt to save these details, so that you don't have to manually enter the details each time you use GraphicsDesk. The Online menu provides more options as well - including allowing you to change your password or retrieve a forgotten password. You can also opt to purchase additional subscriptions and edit your account information. 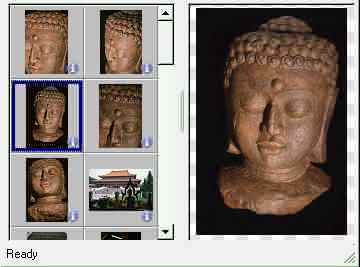 Let's imagine I was searching for a color photograph of the Buddha - a straight keyword 'buddha' yielded 62 results - narrowing the search to color photographs refined the hits to 28. All 28 results were displayed on the left pane as thumbnails - clicking a thumbnail previews the image on the right pane. I needed a particular picture for a Word document, so all I need to do now is to drag it into an open Word window. A dialog box with resize and crop options opened automatically allowing me to choose image size and resolution. I could also opt to flip or crop the image. Support options include FAQs online at the GraphicsDesk site - apart from the online technical support accessible from the Help menu of the product interface. "As to future directions for GraphicsDesk, all I can say right now is that a Mac version is in the works (slated for late 2002) and that we'll be adding new images and image subscriptions in the coming months." My experience from using the GraphicsDesk service for around a month now convinces me it is addictive - with today's broadband enabled Internet services, using GraphicsDesk is intuitive and simple. Finally, reasoning boils down to usage - you could try signing up for a week's usage and find out if the service suits you before deciding to sign up for a longer period. All put together, GraphicsDesk is certainly the most usable graphics' service available online.